Three days ago, my brother Sam and I drove up to Defiance, OH from our hometown of Ottawa, OH to visit "Pack Rat's," a pawn shop where he had seen some decent guitars at a good price (I've been wanting to buy a Telecaster¹ for a little while now). When we arrived there was a sign on the door saying the place was closed from Dec. 24 through Jan. 5 and, not wanting to waste the half-hour drive, we headed downtown to see if we could find any other music stores. We happened across Don's Music Center on Clinton St. and went inside. It's a small store with guitars on one wall and some other instruments and accessories on the other. The checkout counter is just inside the door with some effects pedals on display, and there's another counter in the back where Don does his repairs. Behind that is a stairway leading up to an area for lessons and another repair bench. The prices are written on small posterboard signs behind each guitar. "I've got some sales running through the end of the year - $50 off this guitar (he points at a Les Paul), $30 off those (he gestures at a row of Squiers). Let me know if you want to try anything out." Sam and I quietly look over the guitars on offer and Sam suggests I try out one of the thinline Squier Telecasters since I hadn't played one before. They're interesting, a semi-hollowbody version of a traditionally solid-body guitar. At the direction of numerous signs posted behind the guitars, I ask Don if I can try it out. He takes it down from the wall hook and pulls a little amp over for me to plug into. It's a small Fender amp with some different presets to model different types of amp/cab combos, and I'm not a huge fan of it. I soon discovered that it was just as easy to twiddle the gain/volume/tone knobs on it as to try to pick a preset, so I used it that way and had a much better time of it. The guitar itself wasn't bad; it was fun to try out something different. After the thinline Tele I asked to try out an Epiphone Special and Don was happy to oblige. It played pretty well but I noticed the tuners weren't particularly great. Such are the changes that come with a $200 price drop, I suppose. We were about to head out, but I noticed a banjo hanging on the opposite wall and decided to try it out. It was an Epiphone closed-back 5-string banjo with beautiful wood grain that looked like walnut and had a cool eagle graphic on the back². I asked Don if I could try it out, and he got the banjo down for me. I had never played a banjo before; the closest I'd come was a 6-string "banjitar" tuned like a guitar that I had tried at Guitar Center once. That one didn't really sound like a banjo and just didn't feel right (even though I had never touched a real banjo to know how it was supposed to feel). This felt like a real banjo, and more importantly sounded like a real banjo³. The instrument gave off a warm, plucky tone - sweet, rich, and mellow when played softly; strong, frenzied, and just a little harsh when played harder. This instrument felt natural even though I'd never played it before, and I found myself thinking, "I could learn this." For the past few months I had thought that I might like banjo, just because I like the way they sound. Having played one, I knew this was an instrument I needed to learn. 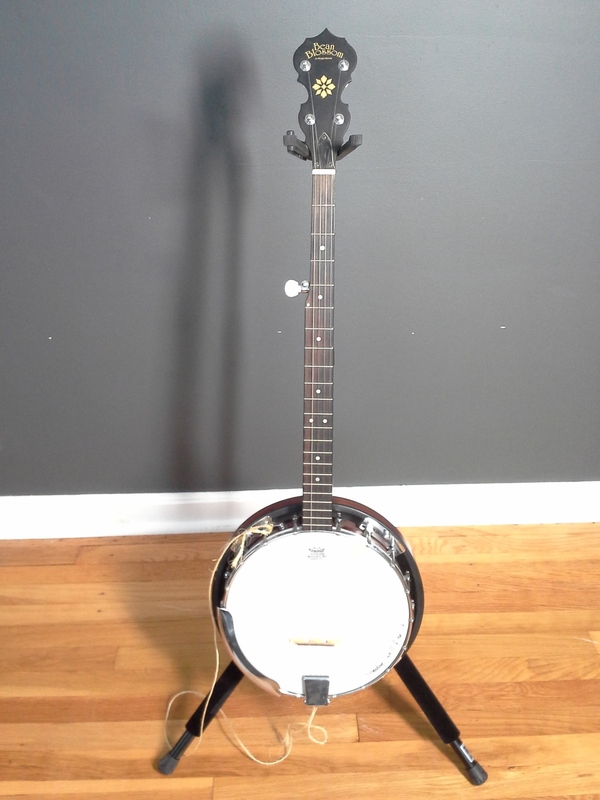 I didn't know how it would happen because money is pretty tight these days, but I knew I wanted to get a banjo somehow. That night, my friend Alex came over to visit, and as it happened he ended up buying a camera flash and cord I had been wanting to sell (conveniently, I had them in Ohio with me). Suddenly, I had over half the money needed to buy that banjo. The next day I was telling my brother Matt about the banjo and how close I was to having the cash for it. In a fit of brotherly love, he PayPal'd me a contribution to the banjo fund, and I was ready to go. I called Don's Music Center and asked about their hours. He said they'd be open until 5pm on the 30th and 11am-3pm on the 31st, except that his dad was sick and in the hospital and he might need to take a trip instead of opening the store that day. I briefly considered heading straight to Defiance but since I hadn't fully discussed the purchase with Caitlin yet and we'd be heading through there the next day, I decided to wait. The next day as we came through Defiance, I turned down Clinton St. and found that Don's Music Center was closed. I was disappointed not to be heading home with a banjo, concerned for Don's dad, but glad that he was able to go visit him⁴. When we got back to South Bend, I started asking around if any of my friends knew of a decent banjo for sale in the area. I checked Craigslist but didn't come up with much. My friend Nat mentioned that he had a banjo but didn't want to sell it, even though he didn't play it much. I asked if he might be willing to let me borrow it until I'm able to buy one, and he agreed to do so. So that's where I am today. I've got a banjo in my hands and this excites me very much. The timing worked out for this thing to be my de facto new year resolution, and as such I went so far as to declare on Facebook, "2016 will be the year I learn to play the banjo." ¹ a Squier Telecaster, that is. I'm not made of money, you know. ³ perhaps it helps that it was a real banjo. ⁴ the first time we visited the store, Don mentioned "I won't ever get rich from this store, but I own the building and everything in it, the building's paid for, and family is the most important thing anyway." Don is my kind of guy.